Pin trading became a phenomenon some time around 2000 with the release of the Disney Store Count Down to the Millennium pin series. One hundred and two pins were released with almost every possible character you could imagine - Mickey, Goofy, Aladdin, Bambi, Jack Skellington, Herbie, The Black Cauldron, Tron and even Roger & Jessica. 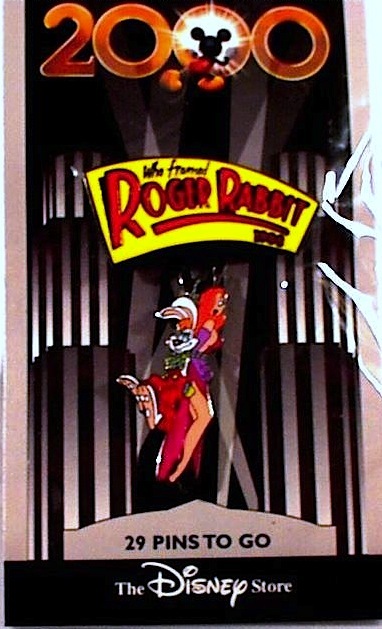 Roger and Jessica are shown tied together from the climactic movie ending. 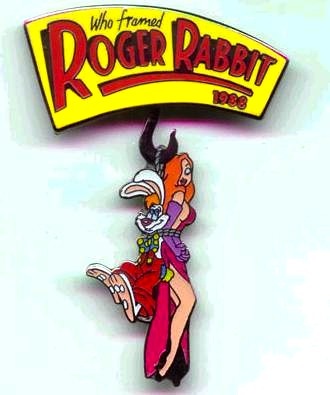 The movie logo and year is above them and they are a separate dangle element underneath.